I’ve had plenty of editors say I need to spin a yarn, but I’ve never been in the position of having to coordinate one. I tried to imagine what that job would be like. You’d sit in your cubicle eight hours a day looking musingly up and to the right, conjuring tales. When one comes to you, you center yourself in front of the computer and enter it into a database. Or better yet, you write each idea down, slip it into a canister, and arrange it on a towering wall of cubbies. Train robbery? Transportation column, row crime. 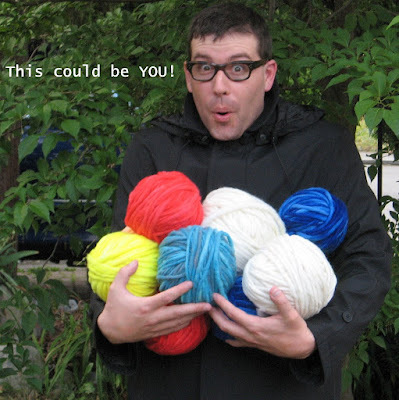 Do let us be clear, all updates, copy and mail you would be responsible will be YARN-RELATED. Juggling ability preferred. Ok, that’s a pretty common way of saying “multitask,” but to me, it’s hilarious juxtaposed with yarn, something one could literally juggle. C’mon, that’s funny. By the way, this job pays “under $35,000” a year. And I’m not qualified for it. This entry was posted in Unhappy Media and tagged juggling, mediabistro, yarn, yarn coordinator. Bookmark the permalink.